Russian President Vladimir Putin said Tuesday that Moscow has held back on delivering sophisticated S-300 missiles to the Syrian regime, while UN investigators said they have “reasonable grounds” to believe both sides in the conflict have used chemical weapons. Putin, a key backer of Syrian President Bashar al-Assad, said Russia has so far refrained from supplying the powerful S-300 surface-to-air missile systems to Assad’s regime for fear of upsetting the delicate balance of power in the volatile region. His remarks came as fighting raged on in Syria’s besieged city of Qusayr, with both sides battling for control of the strategic post, and as US, Russian and UN representatives prepared to meet in Geneva on Wednesday to hammer out details of proposed peace talks. Putin — who has used Russia’s veto at the UN Security Council to shield Assad’s regime from repeated attempts to impose UN sanctions — said Moscow had already signed a contract to deliver S-300s. But he appeared to back down from Moscow’s earlier insistence that the missiles would be a “stabilizing factor” that could deter foreign intervention in Syria. “The contract was signed several years ago. It has not been realized yet,” Putin said at a joint press conference with European Union leaders in the Ural Mountains city of Yekaterinburg. 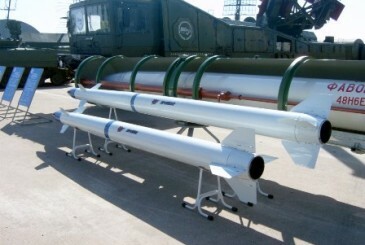 The weapon could theoretically shoot down Israeli jets and harm any Western military support missions. Syria’s civil war, which has already cost more than 94,000 lives in 26 months of fighting, has threatened in recent weeks to turn even more dire with reports that chemical weapons — albeit in small amounts — had been used by both sides. UN investigators in Geneva added to those suspicions Tuesday by reporting they had reason to believe chemical weapons had been used by both Assad’s troops and rebels fighting them. “Allegations have been received concerning the use of chemical weapons by both parties,” said the Commission of Enquiry on Syria in a report to the UN Human Rights Council. There are “reasonable grounds to believe that chemical agents have been used as weapons,” added the investigators. It was the first time the commission — tasked with probing human rights violations in Syria since 2011 — added the suspected use of chemical weapons to its long list of war crimes committed in the country. The commission also called for Damascus to grant full access to Syria for another group of experts tasked by UN chief Ban Ki-moon with investigating the possible use of chemical weapons, who have been barred by the regime. Commission member Carla del Ponte, a high-profile former war crimes prosecutor, warned however that focusing too heavily on chemical weapons could overshadow the overall suffering in the country. The report was released as diplomats from Washington and Moscow as well as the United Nations prepared to meet in Geneva on Wednesday to try to hammer out terms that could get Assad’s camp and the rebels to negotiate directly for the first time. Putin himself said the chances of the proposed peace conference taking place were being harmed by reports of atrocities such as those captured on a video apparently showing a rebel eating the body parts of a slain Syrian soldier. “I hope that such participants of the negotiations do not appear” at the proposed Geneva talks, Putin said. “It would be hard to work with such people,” deadpanned the Russian leader, known for his black humor. Uncertainty in recent days over whether Russia had in fact delivered S-300s to Syria had further strained Moscow’s already tense relations with regional governments and the West. Israeli Prime Minister Benjamin Netanyahu paid a special visit to Russia last month to convince Moscow not to make the shipments. US Secretary of State John Kerry also voiced concern. The latest fighting on the ground saw a missile strike near Syria’s biggest city Aleppo kill 26 people and government warplanes pound Qusayr. The Syrian Observatory for Human Rights said there were numerous dead on both sides but gave no other details. The Observatory also said shellfire near the Russian embassy in Damascus had killed a civilian and wounded a member of the security forces. A representative of the Russian embassy in Damascus told AFP two Syrian security guards had received injuries but that no embassy staff had been killed or hurt in the attack. US-based group Human Rights Watch meanwhile said its mission to Aleppo had concluded that the bodies of 147 men pulled out of a local river between January and March were “probably” executed in government-controlled areas of the northern city. Five Indian Army personnel, including a lieutenant colonel, serving on a UN peacekeeping mission in South Sudan were killed Tuesday when armed rebels launched an audacious attack on a convoy they were escorting. Seven civilians working for the UN mission in the country were also killed in the attack that lasted for about an hour. Five Indian Army personnel, including a captain, suffered serious injuries. 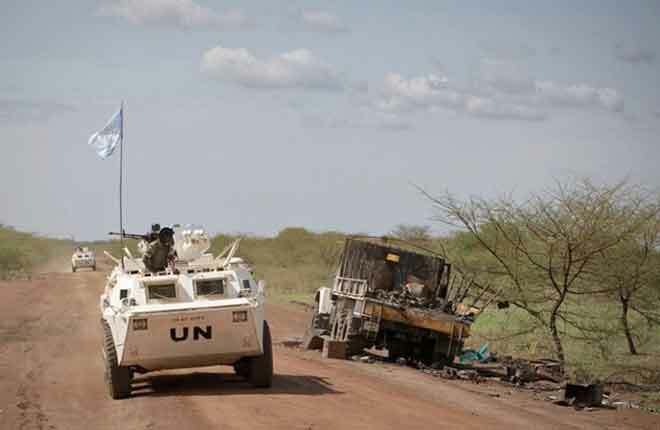 Officials said the 37-member convoy headed to Bor town came under attack near Gumuruk town in the volatile state of Jonglei around 8.30 am local time (1230 IST).